While the weather may have turned cooler, summer isn’t over just yet. Until the last ear of corn has been plucked and the final ripe tomato picked, fall does not begin (technically it starts on Saturday, but who’s counting). In the heat of the summer, I prefer my clams simply steamed with a little butter for dipping. 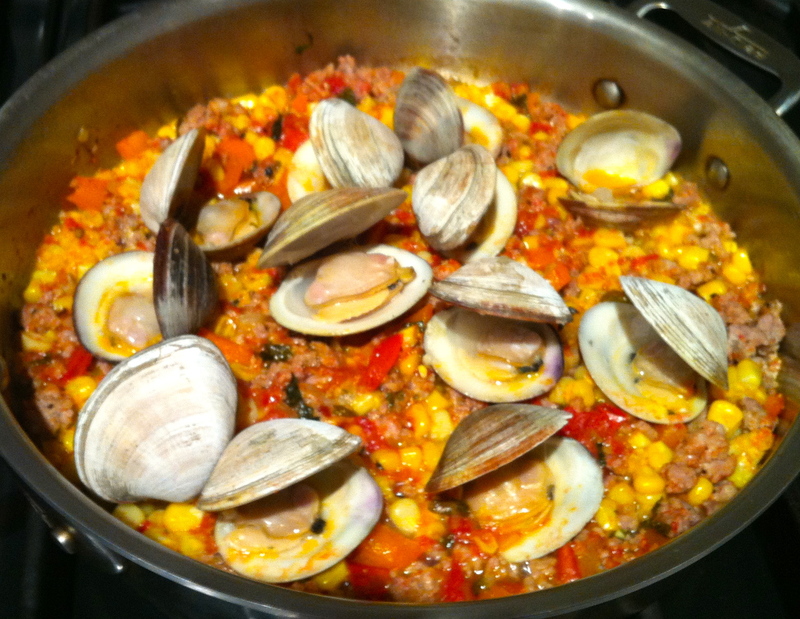 But as the nights become more brisk, I want something more hearty, like sauteed clams, corn, tomatoes and sausage. (Vegetarians can omit the sausage, and the dish will still be flavorful.) Serve it as an appetizer for a group or as a main course over some pasta. Make sure you have bread on hand to soak up the broth. Fortunately, sweet corn and juicy tomatoes are plentiful year round. So no matter what the calendar may say, in just a few minutes, you can invoke the essence of summer at anytime of the year. 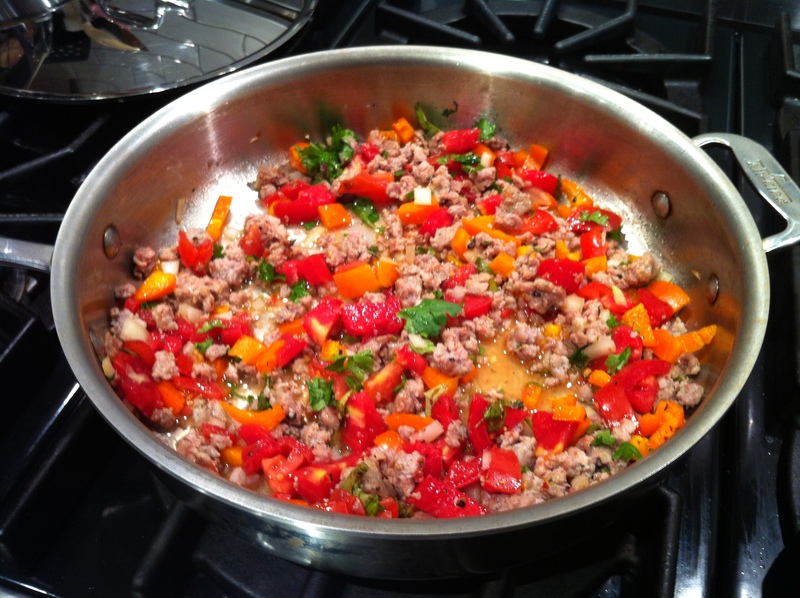 When the sausage is browned, add the tomatoes, onions and peppers. Sprinkle with salt, pepper and herbs. 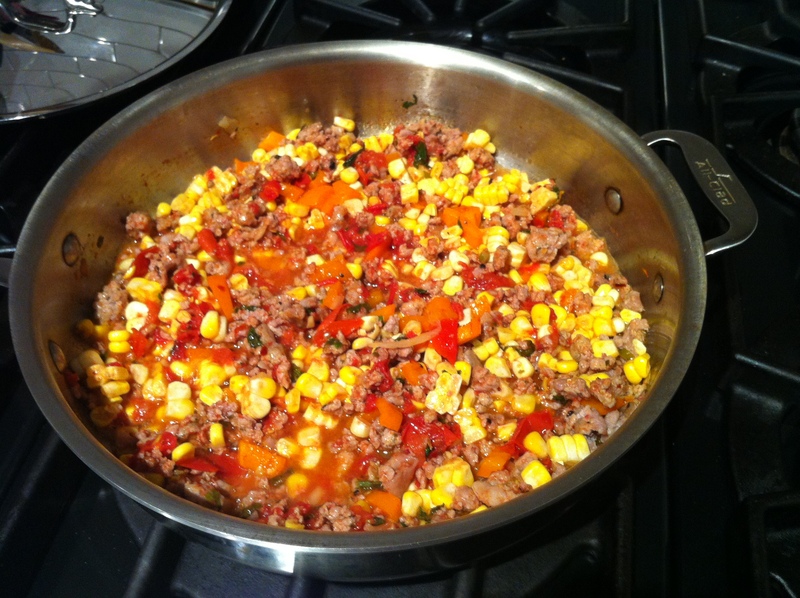 Add some crushed red pepper if not using spicy sausage or hot peppers and want a little heat. Add the broth if you want to make it more stew-like and have more juice to soak up. Saute for 5 minutes over medium low. Slice the corn off the cob and add to pan. Add the wine. Cook for 1 minute. Add clams on top and cover. Wait about 5 minutes and check to see if clams have opened. If not, close the lid and cook for a couple minutes longer or until clams open. (Discard any clams that do not open.) 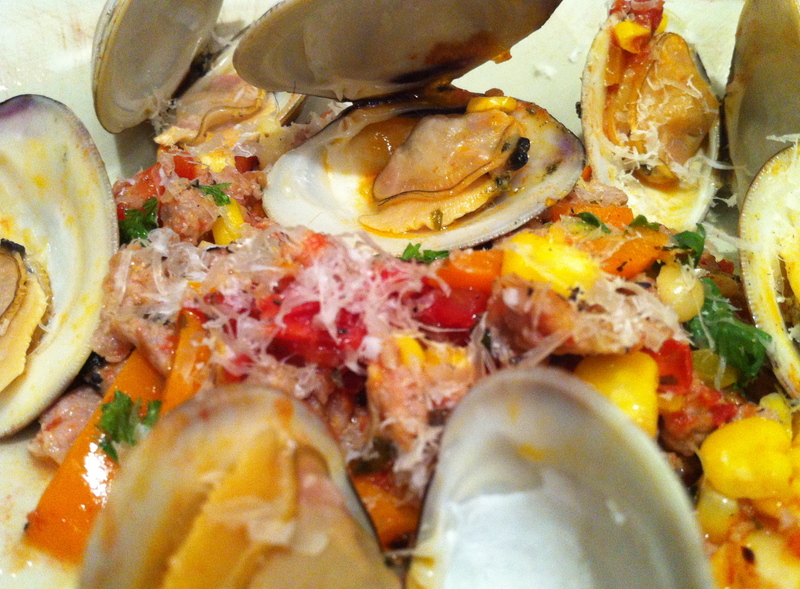 Remove clams from the pan and top with the sausage mixture or just stir the clams in the pan to mix the flavors. Sprinkle cheese on top and serve as desired. To drink: have whatever cooking wine you used.